Veteran and recently certified divers alike can take advantage of our tour, while visiting Grand Bahama Island, which will get you down under the sea to investigate both a spectacular coral reef and a massive, sunken wreck. The waters of the Caribbean Sea are so amazingly crystal clear that you will get a perfect view of the rich diversity of life that inhabits its lower depths. Tours are led by practiced guides who are very flexible and more than happy to accommodate the desires of our clients. You decide just how far below the surface level you would like to go, at possible depths of up to 80 feet. 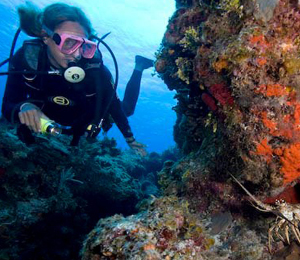 Tours begin with a trek to one of the many amazing reefs surrounding Grand Bahama Island. Marvel at the fascinating and multi-textured reef formations while also witnessing the many tropical fish and other aquatic species that fill the area. Many of our dive sites are contingent on the weather conditions of a giving day and our professional guides will wait until the day of the dive to determine the best locations for your expedition. As always, they also base the location on the desires of our clients. The second dive location will be an awe-inspiring wreck which is now home to a variety of marine life forms. One possibility is Theo's Wreck, a 230-foot long ship sunk in 1982 and which now lies 100 feet below the sea. It is now a host to gorgeous corals and sponges as well as slippery moray eels, graceful sting rays and a flurry of butterfly fish. For more than 30 years, our guides have been the trusted authorities on Grand Bahama Island. Your will find this undersea journey to be a very pleasurable experience with our PADI certified divers and instructors at your service. Unfortunately pick up is not provided for this activity. Just the tanks, weights, and belt are included. Equipment pricing is listed below. What is the price for equipment rental? These prices are subject to change. I have been to the Bahamas many times, but UNEXSO Two Tank Reef/Wreck Dive is one of my favorite trips! It includes everything that everyone should do here. As a Bahamas veteran, I can say only the best about this experience!